Institute of Banking Personnel Selection (IBPS) has released notification for conducting Online Common Written Examination (RRBs CWE-III) for the recruitment of Group A Officers of Scale I, II & III and Office Assistant (Multipurpose) vacancies in 56 Regional Rural Banks (RRBs). Eligible Candidates may fill online application form on or before 09th July 2014. The IBPS RRB CWE-III Examination will be conducted online tentatively in September 2014. Candidates will be selected on the basis of their performance in online exam. *** It depends on category of state. $$$ It depends on officer cadre. Number of questions in each sections will be fourty (40) only and total marks comprising of all sections will be 200. Time duration for the examination will be of 2 hours and 30 minutes to 3 hours depending up on the cadre. 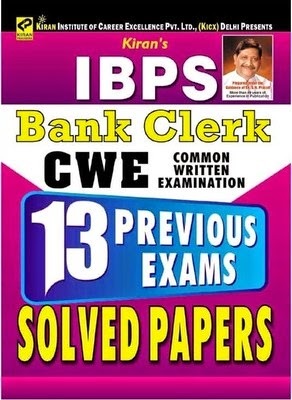 We enlist a list of books for the preparation of IBPS CWE-III for RRB 2014 subject wise. Although you can go for a cheap guide book found in the market, but this will never help you in clearing your concepts to crack future examinations. So, it is advisable to buy these texts, carefully understand the concepts, then solve question papers from previous years. One can buy these texts online from Flipkart.com .All you need an ATM card or Internet Banking facility, you will get up to maximum 55% discount. The books will be delivered by maximum 3 to 5 days. 2. A Modern Approach To Logical Reasoning by Aggarwal R. S.
Hope these books will help you to crack IBPS CWE-III for RRB 2014. Best Wishes !